Homeland Security's border patrol drones cost $12k an hour to fly and don't do much. 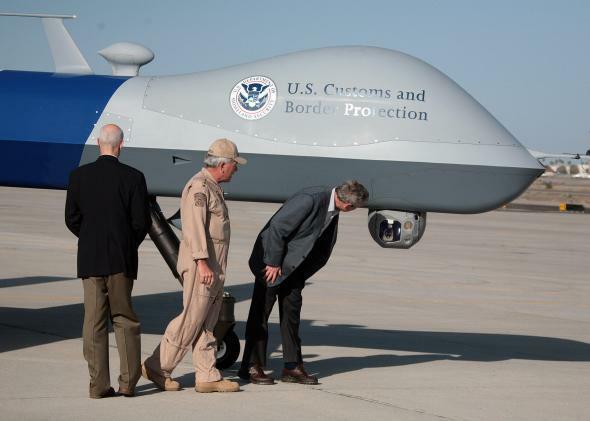 President George W. Bush and then-Homeland Security Secretary Michael Chertoff look at an Arizona/Mexico border predator drone in April 2007. Customs and Border Protection monitors about 7,000 miles of U.S. border and 2,000 miles of coastal waters. It’s a lot of ground to cover, so the agency uses a number of different strategies to get the job done. One is its 10 Predator B drones that patrol parts of the Arizona and Texas borders. But in a report released on Dec. 24, the Office of Inspector General revealed that the drones are underutilized and cost way more to operate than CBP originally estimated. We estimate that, in fiscal year 2013, it cost at least $62.5 million to operate the program, or about $12,255 per hour. The Office of Air and Marine’s calculation of $2,468 per flight hour does not include operating costs, such as the costs of pilots, equipment, and overhead. By not including all operating costs, CBP also cannot accurately assess the program’s cost effectiveness or make informed decisions about program expansion. Meanwhile, CBP planned for 23,296 total flight hours per year, but logged just 5,102 flight hours in 2013. And the drones only played a part in catching 1.8 percent of border crossers in the Tucson region, and 0.7 percent in the Rio Grande Valley region. Not exactly stellar numbers. Given the cost of the Unmanned Aircraft System program and its unproven effectiveness, CBP should reconsider its plan to expand the program. The $443 million that CBP plans to spend on program expansion could be put to better use by investing in alternatives, such as manned aircraft and ground surveillance assets. Nonetheless, these drones seem about as useful as kangaroo-watching quadcopters. And they cost a heck of a lot more.